Description Beautiful Grade AAA Ametrine emerald cut gemstones are a medium purple and medium golden yellow ( as image displays) with very good color separation and have a clarity rating of eye clean plus. 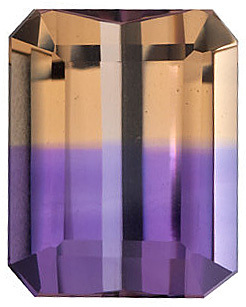 Ametrine gemstones are subject to traditional heat treatment and are sourced from Bolivia. NOTE: Be sure to select the RIGHT gemstone/diamond by millimeter size only. Selecting your gemstone/diamond by carat weight is NOT ACCURATE. The best way to select the right size gemstone/diamond is to use our size chart image or consult with a local jeweler to measure your setting or gemstone.